Situated in the upper reaches of the Hangang River, Namhangang has clear water and serves as a source of water for the citizens of Seoul. 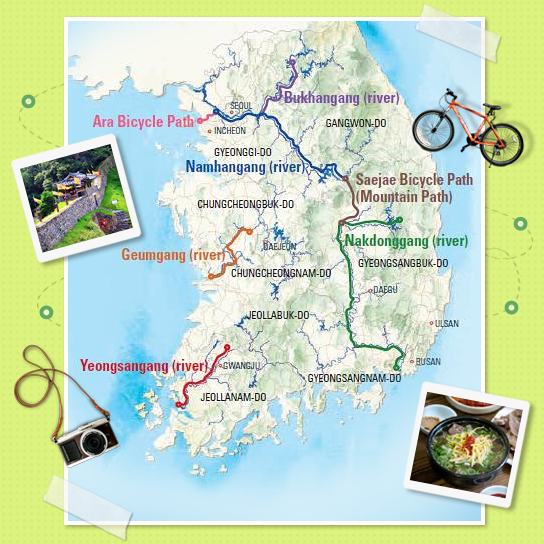 The Namhangang River bicycle route starts at Paldangdaegyo Bridge. 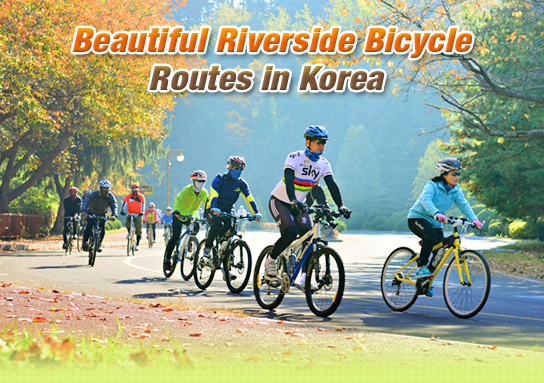 Set against a beautiful landscape, this 132 kilometer-long route extends through Namyangju, Yangpyeong, Yeoju, Wonju, and Chungju, before ending at Tangeumdae Terrace & Park in Chungju. This route is like a natural and history museum as it passes by natural attractions like Dumulmeori as well as historical sites like the site of Jeong Yak-yong. The cement-paved route passes by three weirs constructed as part of a government project—Ipobo, Yeojubo, and Gangcheonbo—and runs along a railway. Riders will pass by a tunnel, the riverside, a closed train station, and the Bukhangang iron bridge. The Neungnae Station, with its pretty red postbox, is situated in Joan-myeon, Namyangju-si. Now a closed station, it houses a café on a train and a bicycle rental shop. Take a bicycle and ride on the railway, tunnel, and iron bridge. At the Neungnae Station Studio, visitors can wear a school uniform and take black-and-white photos. A great philosopher and scientist of the 18th century, Jeong Yak-yong (1762-1836) was born in Neungnae-ri Village in Namyangju-si. The place is a beautiful riverside village that was designated a Slow City. Visitors will find the birth home, tomb, and museum of Jeong Yak-yong who published over 500 books in his lifetime. Climb up the observatory in front of the village to get a great view of the Namhangang River. Dumulmeori in Yangpyeong is the place where Bukhangang River and Namhangang River join. It is a delta formed by deposits of gravel and sand. The landscape around the nearby village is beautiful, attracting many movie, commercials, and drama producers. In the morning in winter, the fog creates a fantastic ambiance. The 400 year-old zelkova tree often features in TV dramas. Established on a nearby riverside wetland, Semiwon is an extensive park and home to lotus and various other water plants. One of the three weirs built on the Namhangang River as part of a government construction project, Ipobo has been called the most beautiful. Up from Ipobo is Yeojubo Weir, which is shaped like a cheugugi, the world’s first rain gauge invented by King Sejong the Great, and Gangcheonbo Weir, which is shaped like a Hwangpo sailboat. By Gangcheonbo, there is the Hangang River Culture Pavilion with exhibits of artworks created by famous artists with inspiration drawn from the river and water. The Silleuksa Temple in Yeoju dates back to the Silla Kingdom. It is home to a number of cultural assets, including the treasured multi-story marble stone pagoda. Take a Hwangpo sailboat at the ferry dock in front of the temple and enjoy the riverside landscape on Namhangang River. Nearby is the Mok-A Museum with exhibits of Buddhist artwork, as well as the Yeoju World Ceramic Livingware Gallery with exhibits of ceramic ware produced in Yeoju and hands-on programs for making pottery. Designated a UNESCO World Heritage site, the Royal Tomb of King Sejong the Great (Yeongneung) is the joint tomb of King Sejong and his wife Queen Soheon. King Sejong, who created the Hangeul Korean alphabet, is revered as the greatest king in the history of Korea. Next to the tomb is the royal tomb of King Hyojong and his wife Queen Inseon (Nyeongneung). Angseong Hot Spring is a rare carbonated hot spring, which is also a global phenomenon. Bathe in the water heated to 25 degrees Celsius for just two minutes and your skin will have a tingling sensation. After about 5 minutes, your whole body will be covered with carbon bubbles. About ten minutes in this lukewarm spring water, your skin will start to turn red, but your whole body will have warmed up and your fatigue will be relieved. Designated a national treasure, the Chungju Goguryeobi Monument is the only extant monument from the Goguryeo era on the Korean Peninsula. It is considered to have been built by King Jangsu (20th king of Goguryeo; reigned between 412 and 491) to commemorate the occupation of the Hangang River area. A stone pillar measuring two meters high and 0.5 meters wide, the monument has writing on all four sides, but the writing has been worn away so much that only about 200 letters remain readable. Nearby, there is a 14.5 meter-high stone pagoda, which is called Jungangtap (Center Pagoda) because it is situated in the center of the Korean Peninsula. Also in the nearby area is the Liquorium, which has on exhibit Korean traditional wine, as well as liquors and liquor-making equipment from around the world. The Tangeumdae Terrace & Park is a beautiful park situated on the riverside of Namhangang River. It is called Tangeumdae because this is where royal court musician Ureuk of the Silla Kingdom used to play his gayageum (traditional Korean string instrument). Ureuk is recognized as one of the three most celebrated musicians of all time in Korea. Chungjuho Lake is the largest artificial lake in Korea, and was completed in the 1980s. Take a ferry from the Chungjuho Ferry and enjoy a view of Woraksan National Park, Geumsusan Mountain, Gudambong Peak & Oksunbong Peak. Yangpyeong Haejangguk is a warming and tasty treat made of congealed ox blood, lungs, omasum tripe, bean sprouts, and dried radish leaves in a hearty beef broth. There are many restaurants that specialize in Yangpyeong Haejangguk near Yangpyeong Station and Dumulmeori. The area is also famous for makguksu noodles. Cheonseori Village near Ipobo Weir in Yeoju is famous for makguksu. The first version of makguksu noodles is made by rinsing cooked buckwheat noodles a few times in cold water and then serving it with a hot and spicy red pepper dressing. The second version is served in a refreshingly cold and savory broth of dongchimi (a type of radish kimchi). A great accompanying dish to makguksu noodles is pyeonyuk, which is meat that has been boiled, pressed, and sliced thinly. Another specialty of Yeoju is rice prix-fixe, which features glossy rice. The rice produced in Yeoju based on the area’s high quality water used to be presented to the king. The rice is also prepared with the addition of black rice, black beans, sweet potatoes, and jujubes. The prix-fixe comes with 20 or so side dishes, including various seasoned wild vegetables, bean paste soup, and grilled fish. There are a number of pensions equipped with a spa and swimming pool located along the river in Namyangju, Yangpyeong, Yeoju, and Chungju. The Daemyung Resort and Hanwha Resort are located in Yangpyeong, and Ilseong Namhangang Condo is located in Yeoju. In Chungju, there are many condominiums and hotels in the areas of Suanbo Hot Spring, Mungang Sulfur Hot Spring, and Angseong Carbonated Hot Spring. Visit the homepage of the relevant self-governing bodies to book a clean accommodation in a private residence temporarily taking lodgers at an affordable price.